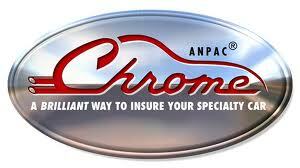 CHROME is one of several specialty insurance products offered by ANPAC. It was developed by ANPAC more than 13 years ago by employees who are also classic car enthusiasts in response to the lack of specialty car insurance available within the industry. “Many major insurance companies either don’t insure these vehicles at all, or insure them as they would insure any other non-collectible vehicle, often with restrictions and without coverage for custom features like paint, body and other modifications,” said Janet Clark, ANPAC’s vice president of underwriting services, lead-developer of CHROME insurance and self-proclaimed car buff. CHROME is an acronym that stands for classic, hot rod, replica, original, modified and exotic vehicles. Special CHROME policy features include agreed value, annual mileage up to 10,000 miles, roadside service and towing options, choice of repair facilities, spare parts coverage, discounts for collectors who insure multiple specialty vehicles, endorsements for vehicles under construction and personalized service through local agents who offer a continuum of insurance and related services. “One of the things our CHROME clients appreciate most is that they can get the specialty car coverage they need from the same company that insures their home, auto and other possessions,” said Clark.